In two previous articles I introduced The spherical Earth model and importing data into SQLite for querying geographical data. In this article we're going to have a look at importing the data into MySQL and finding out how to best store and query spatial data in the databases. MySQL has some support for Spatial Extensions, but it's not particularly useful. For example, there is no way to query anything within the radius around a specific point. Their community pages list a method of implementing it, but it only calculates for a flat Earth model. We can pre-filter the result set even more, by also limiting on the longitude boundary. This involves a few more calculations than for the latitude boundaries. The distance in degrees longitude that belongs to a distance in km depends on the latitude of the location. So first we need to calculate the latitude boundaries as we have done above, and with that information calculate the longitude boundaries. In the first step (red), we calculate the northern and southern boundaries of the circle. 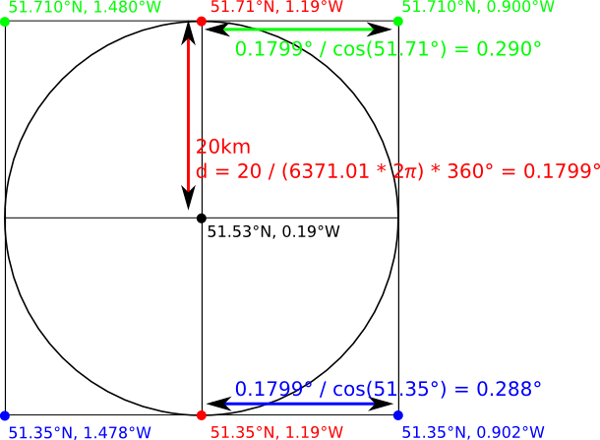 We then calculate the western and eastern boundaries for the northern boundary (green), and southern boundary (blue). In this article we saw how we can use a MySQL stored procedure to find our pubs and bars within a certain distance from a central location. In the next part, we will be looking on how to solve the same problem with PostgreSQL. Although I'm still not convinced that using the haversine formula for small distances is the best approach here. For those distances (say, up to a few hundred meters, or maybe even a few several kilometers/miles) we can assume a Euclid geometry so Pythagoras is probably more efficient to use in this case. So I'm very curious to see on how those 2 different formula's would differ in output when querying on short radius and how the performance would be. Use 3959 instead of 6371.01 for miles. You sure it is not better to use the spatial extension in MySQL if you have very large datasets? Say I want the 10 closest POIs to a (lat,lng) point, but I don't know if they are within 1 km, 10 km, 100 km or 1000 km? I could of course do a series of queries, first with 1 km, then 5 km if too few are returned within 1 km, then 10 km and so on - but that doesn't sound very effective either? But I would be interested to know if MySQL by default has a functionality to return all locations within bounding box. So lets say I have a top left hand and bottom right corner coordinates of the map and I would like to display all pubs that would fit on this map. If not default in MySQL, how can this be achieved still keeping the performance? Inspiring, I was happy to know my shared hosting had the spatial extensions to its MySQL, but quite disappointed to know said extensions have no distance function working. So what's the point of having them altogether. Your approach I like very much. As a previous commenter said, this is not much useful if you want to order by distance unregarding of boundaries, but since I wouldn't be doing this anyway.. thanks! Q: Do you know any tricks to creating a good index? To c# can you point be in the right direction? I am working on a site that needs to regularly do bounding box queries and could easily have millions of records per queried table. I really like this example but I am worried about how well separate indexes on latitude and longitude will hold up on larger data sets, since the data cannot be stored using spatial indexing. Do you think that there will be a significant performance hit using MySQL to do this over PostgreSQL? To clarify I would still be using bounding box and haversine instead of relying on the built in methods if I used PostgreSQL it would literally just be to ensure the data is physically stored based on spatial indexes. I do not know how much testing you did but you seem to be familiar with both systems, and I would love to hear your opinion on the matter. Also I cannot seem to find the guide on PostgreSQL implementation of this that you mentioned you would release, can you link me to it? I must admit I have never written the PostGreSQL variant. Instead I started experimenting with MongoDB's features instead, mostly because I work for them now. Theoretically, a spatial index would be better because having a compound index with two ranges for each of the index elements (a range on lat and a range on lon) is difficult for non-spatial indexes to handle. I am currently writing a talk on MongoDB 2.4's geo features, and as part of that I am exploring the new geospatial index. The intention is then to also write a similar article to this one but instead using MongoDB. If you let me know what sort of queries and results you expect, and what sort of dataset, I can make sure to address that in this article. If you intend to use PostGreSQL, I would suggest you use the PostGIS extensions to do you querying, as that will be a lot faster than just relying on a spatial index. nice post. I have avoided distance() because I just use a box. But I may try "stored procedures" which I didn't understand. I am also curious about mariaDB which is up and coming.